An evaluation of the lungs done under conscious sedation (twilight anesthesia). This procedure is performed by one of our pulmonologist, to evaluate an abnormal CXR or CT scan, to evaluate a symptom such as chronic cough or for therapeutic purposes (eg – removal of a suspected foreign body, such as an aspirated pill). 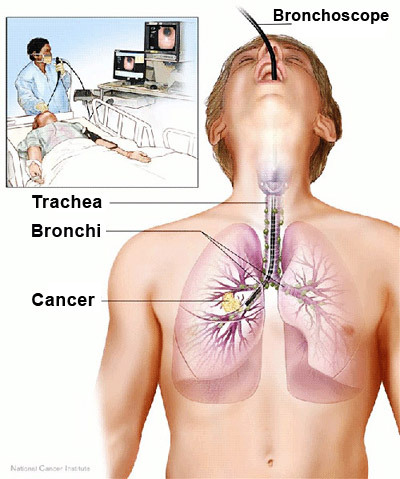 The bronchoscope is a small flexible tube containing a light and a camera. It has chambers to allow sampling by way of lavage (rinsing) of the airways, brushing the airways or biopsying the airways, lung tissue or surrounding lymph nodes. Bronchoscopies are performed in the Endoscopy Department at John Muir Walnut Creek. To download a Fiberoptic Bronchoscopy Patient Information form click here.